We opted for an afternoon bus ride from Ho Chi Minh to Mui Ne because we didn't want to wake up early. Since Mui Ne is more than four hours away from Ho Chi Minh by bus, it was already night time when we arrived at our accommodation. 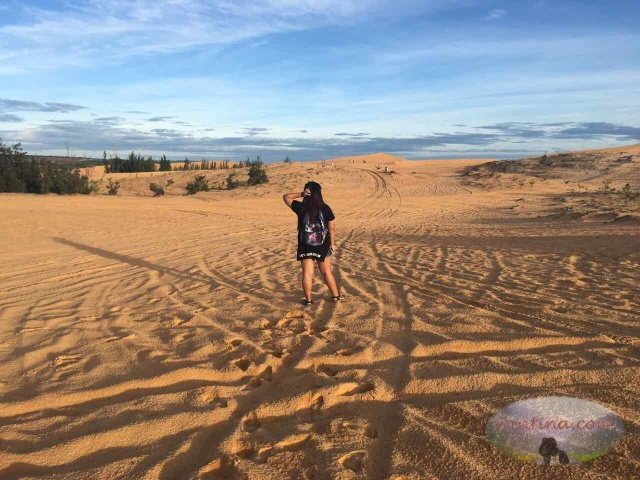 Good thing, the bed and breakfast owner was so kind that even with very short notice, he was able to book us a half-day tour of the sand dunes and fairy stream in Mui Ne. 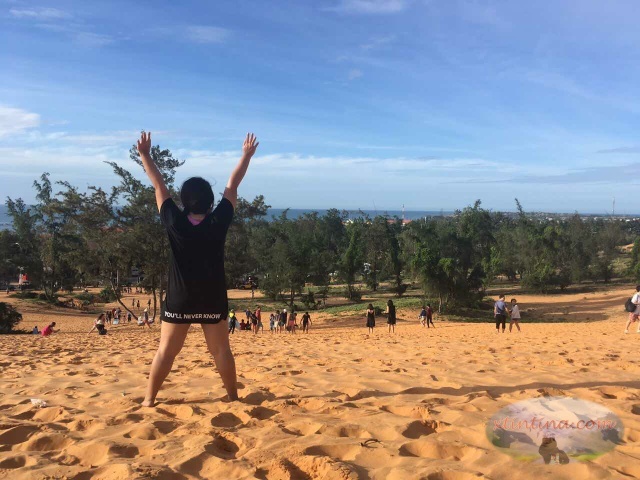 Yep, we didn't even stay for 24 hours in Mui Ne but it was very worth the trip (at least for us). 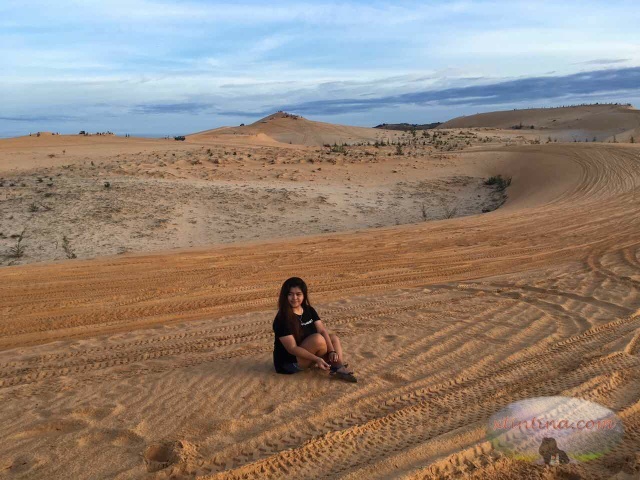 "Hindi naman ako sinabihan na kasing dami pala ng mga buhangin dito sa sand dunes 'yung pasensiya na dala ko kapag pupuntang Cambodia (!!!) at Vietnam." We woke up early because this was a sunrise tour. The jeep picked us up at around 5:30 AM and we joined other group of tourists for this trip. This third time sand dunes experience is very much different with how the sand dunes in Death Valley, California made me experience. lolz. As the sun slowly rose from the horizon, the sand dunes looked more and more beautiful. This part, however, has a lot of plants and ATC tracks so if it's your first time and you want to see the "wave of the sand", might as well pay for your ride because the view is definitely much more beautiful the farther you go from the gate. Our driver set a time when we should be back to gate so we can proceed to the second place in our itinerary. Above is the vehicle we use to tour around Mui Ne, I sat at the back seat. <3 I think that seat is the next best to the passenger's seat. There are a lot of tourists in the area. Walking in the red dunes is a lot more difficult that walking in the white dunes because it's "uphill" plus the heat of the sun also drains energy. I also took of my sandals because it makes it easier for my feet to sink in the sand. Albeit much smaller than the red dunes and more crowded, there are a lot of vendors and children offering their "sled" for rent. Beshy, di na nga ko makalakad ng maayos paakyat e pags-slidin mo pa ko pababa para umakyat ulet? It's overlooking the ocean which makes it really interesting. Kita niyo 'yung form nung mga tao galing sa baba, mahirap kasi talaga umakyat. 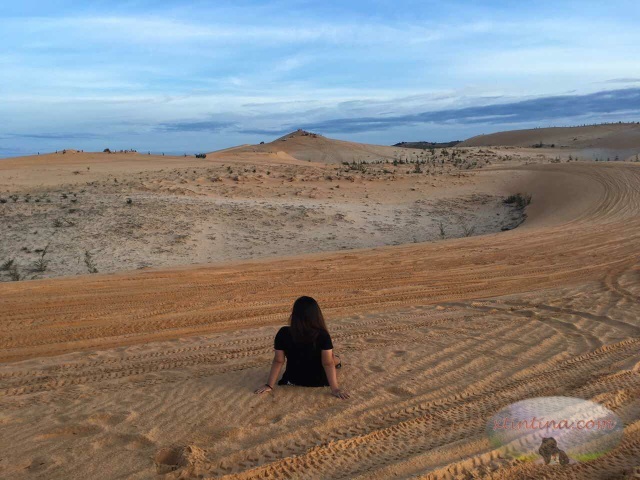 Paoay Sand Dunes, Ilocos link: here. Sand dunes are interesting especially if you haven't been into one. I loved how we saw the sun rise there but the next location in our morning tour, is by far, the best place I've gone to while in that part of Vietnam - The Fairy Stream.